Methamphetamine hit the area like a wave in 2010, leaving behind addicts, burned buildings and endangered children. Police continue to turn up labs in Berwick, Danville, lower Luzerne County, and scattered areas across Columbia and Montour counties. This series ran in the print edition over three days, May 12 to 14, 2013. You'll find the stories here. 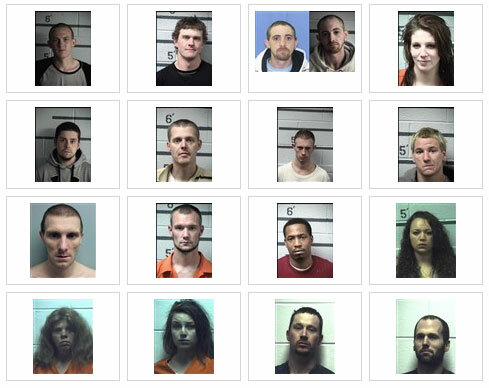 The photos and map will be updated regularly with new suspects, cases and lab sites. If you're interested in the latest meth-related news from our area of Pennsylvania, scroll down the page, or click here. BERWICK -- The local methamphetamine boom can be traced back to a simple recipe, brought to town by a Berwick native returning from the South. When local authorities were first warned years ago about meth labs, they were taught to look for giant drums of chemicals used for mass production. But when the first meth lab surfaced here, it was a single bottle of liquid found bubbling in the basement of a Berwick home in 2010. EDITOR'S NOTE: This review of methamphetamine busts and suspects comes from court records, police reports and newspaper archives. The following story is based on the recollections of a recovering methamphetamine addict who agreed to speak on the condition his name would not be printed. His name has been changed, but no other details have been altered. People who use methamphetamine become exhilarated, hyper-alert and hooked. "It's pretty much instantly addictive," says State Police Cpl. John Casciano. "You use it, and it just takes over." BERWICK -- After police have hauled the suspects away and the hazmat team has packed up the evidence, the scene of a meth lab is still a dangerous place. The chemicals used to make the drug -- household cleaners, camping fuel, stripped batteries -- can leave an invisible toxic hazard behind.